As predicted by YKI in March, the AL West and NL West continue to have the most intriguing division races in baseball. The focus this past week has been on the AL West, as two of the three contenders acquired Ace-caliber pitchers; the Texas Rangers giving up uberprospect Justin Smoak to acquire Cliff Lee, and the Angels abandoning Joe Saunders and prospects in favor of Dan Haren. Both acquisitions provide front-end stability, consistency and legitimacy. Though Lee, the former Cy Young award winner, is the superior pitcher of the duo, Haren has pitched successfully in the AL West (A’s, 2005 – 2007) and will help offset the Angels’ recent offensive issues. . .in this new era, pitching & defense win ballgames – so additional pitching, specifically ace Ace, will help during the proverbial dog days of summer. . .which brings me to the upstart Rangers. Though most experts thought the Angels would run away with the division,a few saw the glimmer of breakthrough potential with the addition of Vladimir Guerrero and the maturation of Neftali Feliz, Tommy Hunter & Elvis Andrus. The question was the pitching, however, and with Scott Feldman, CJ Wilson & Colby Lewis (as well as Hunter) anchoring the staff. . .there were indeed many questions. Lewis just returned from Japan, Feldman and Wilson had bounced between the bigs & the minors throughout their careers, and Hunter is a rookie. At this point, the Rangers have the third best ERA in the American League, and the addition of Lee only bolsters that staff. But a larger, and deeper question arises – the climate. 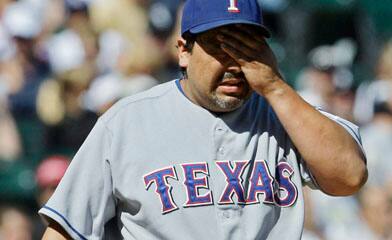 Texas Rangers pitchers have a history of wilting in the subtropical humidity and litany of 100+ degree days in August. Experienced pitchers are conditioned to conserve, pitch to contact and withstand the atrocious conditions, but can these youngsters keep up the solid performances? Or will they melt down quicker than the sweat glands on Vicente Padilla, former Texas Ranger ace, who was known to sweat through “three or four” jerseys per game on days he’d pitch. Time will tell – and so will Haren & Lee. Should be a great – and scorching – summer out West. he will come out of retirement and anchor the staff. to package a trade for a hitter. We will see. I think it’s a long term deal. Halos will get another bat in free agency next year and hope Kendry comes back healthy. I don’t see what pieces they could trade for a bat. Most likely will rent a player like Adam Dunn or Prince Fielder. Good work on the Rangers angle. I remember in the early 90’s they’d always die off when the heat struck, Jose Guzman Kevin Brown. Not Ryan though.